How to get there: The best starting point is the small village of Kaloskopi. 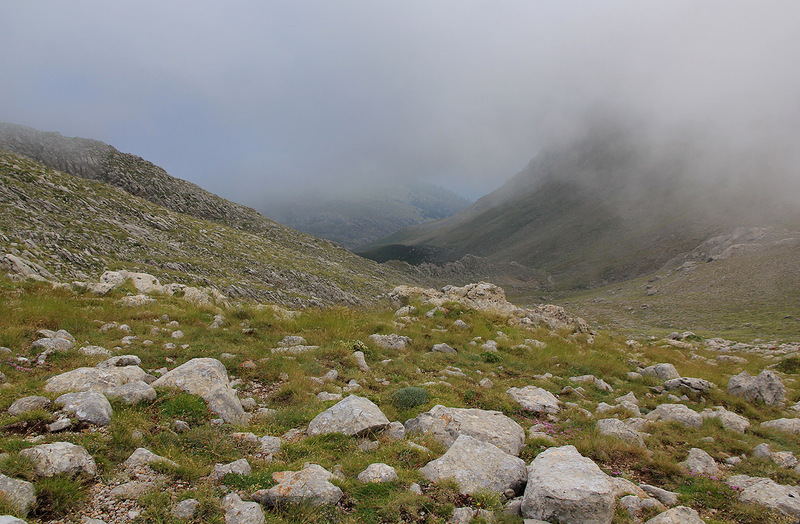 Kaloskopi is north of Amfisa, larger points of references are south-west of Lamia and north-west of Delfi. A detailed description to the trailhead is as follows. Locate the southern entrance (from the highway) to the village of Kaloskopi and measure from here. (The road to Kaloskopi forks right and goes downhill at this point.) Continue north on the main highway 1.1 kilometer. At this point, make a sharp left turn onto a dirt road. Continue to kilometer 3.5 where there is a crossroad, continue straight. At kilometer 4.0, stay left (a small road forks off right). At kilometer 5.2 the road forks, take the left branch. Continue to kilometer 6.6 and make a sharp left here. The road is a bit rougher, but should be possible for ordinary cars if driven with care. You enter a few switchbacks, then a traverse right, before arriving at the trailhead at kilometer 8.7. This is right in the 3rd switchback, there is plenty space for parking without obstructing the road. This location is N38:39.885, E022:16.217, elevation about 1535 meter. 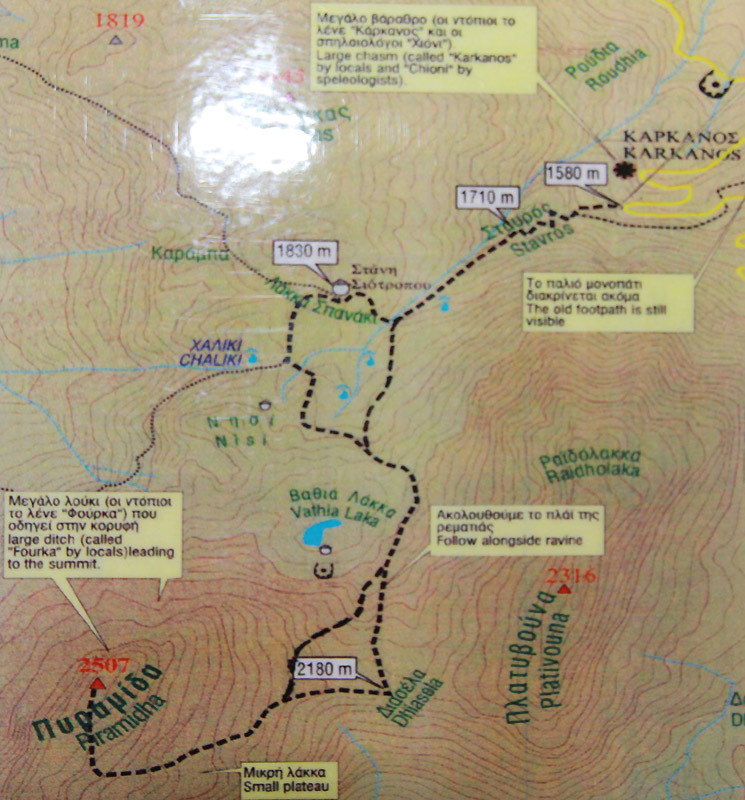 Here is a pretty good map showing the road from Kaloskopi to the trailhead. 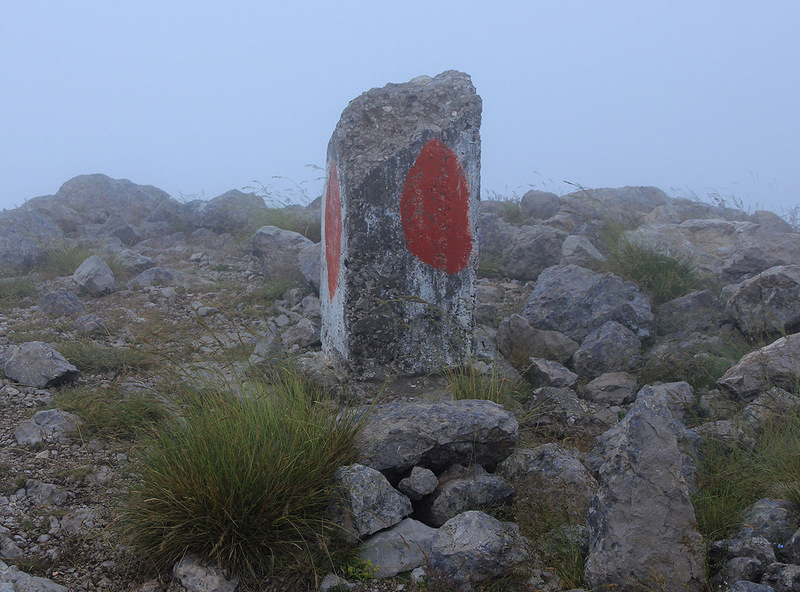 Route description: From the trailhead, the route to the summit is marked with red paint. 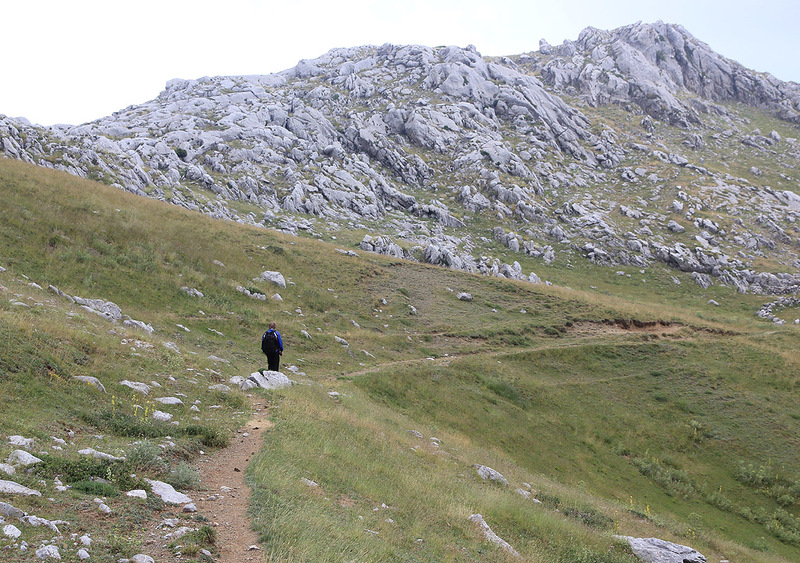 It starts a few meter to your right (when facing uphill) and starts out a bit steeply among some rocks. The easy to follow trail ascends the slope above you (zig-zags), then runs further in on the left side of a small valley before arriving at a flat area with a small creek, very suitable for camping. From here, the trail runs directly up the grassy hill above, people have chosen different paths and the trail is less well defined. On top of this hill, you face the mountain straight ahead across a flat grass plateau. There are domestic animals in the area as well as shepherd dogs that may act unfriendly. 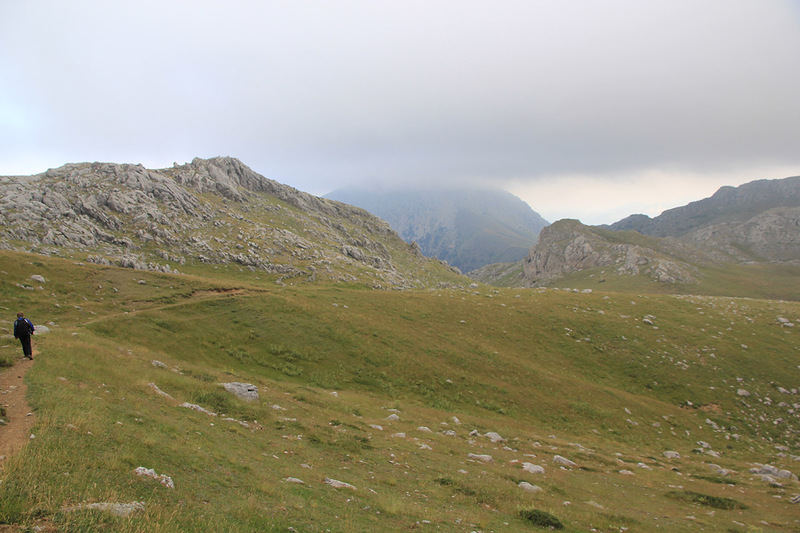 Do not cross the large flat grass area, but turn left and follow the fairly well marked trail as it bends left, then traverses up the slope on your left in order to gain the broad slope that leads to a saddle connecting with another valley. After gaining this broad saddle, the route now makes an ascending traverse on the peak itself, staying on very easy slopes as the route will gradually bend more right. 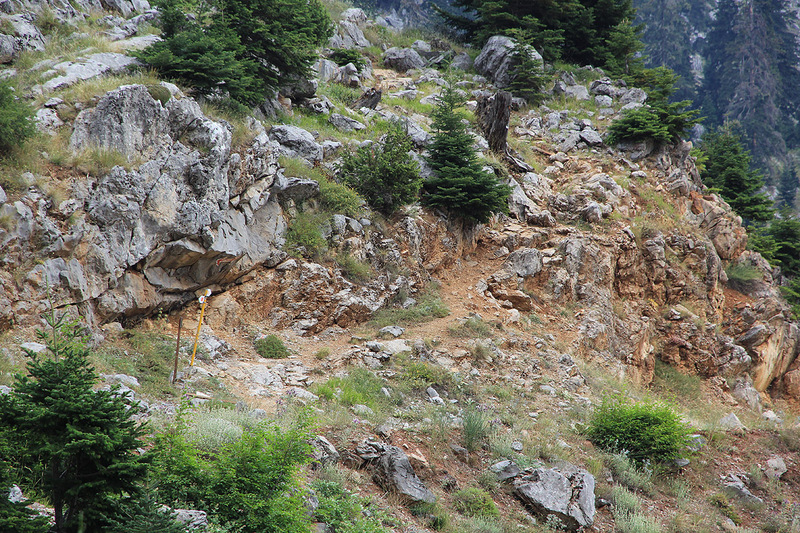 The path is not very well defined, but the red paint is visible on the rocks. In any case, it is not critical exactly where one walks, the terrain is very easy. 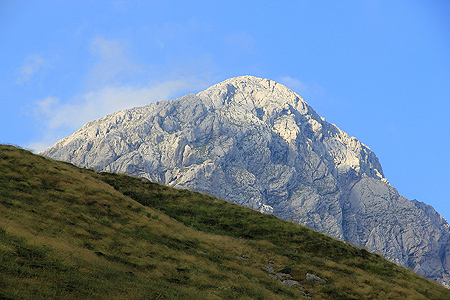 In this way, you will reach the summit ridge (also broad and flat), a bit left (as you face uphill) of the highest point. Finally, walk along the ridge to the summit marker. You will notice that the mountain has a steep side on the left side of the ridge as you walk the last (short) stretch to the top. 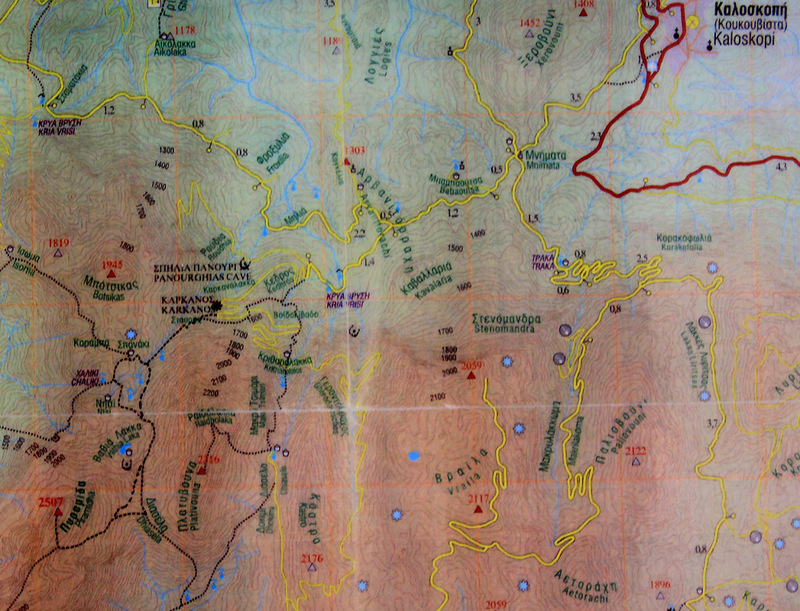 Here is a small map outline of the route from the trailhead to the summit. We drove from Paleros on the west coast to Kaloskopi. 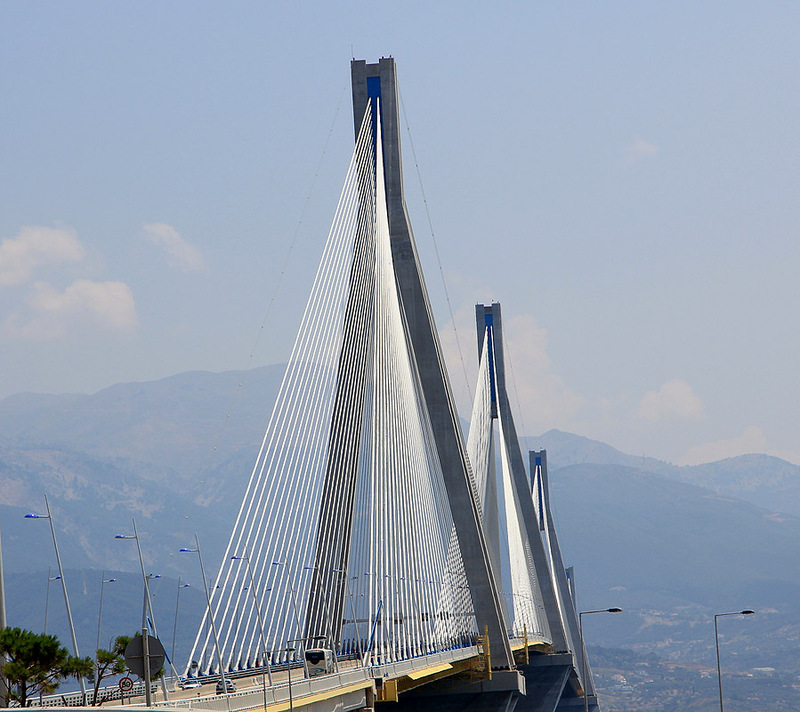 Except for making a wrong turn and almost have to pay 25 euro for crossing the bridge to Peloponnes, where we did not want to go, the travel was uneventful. 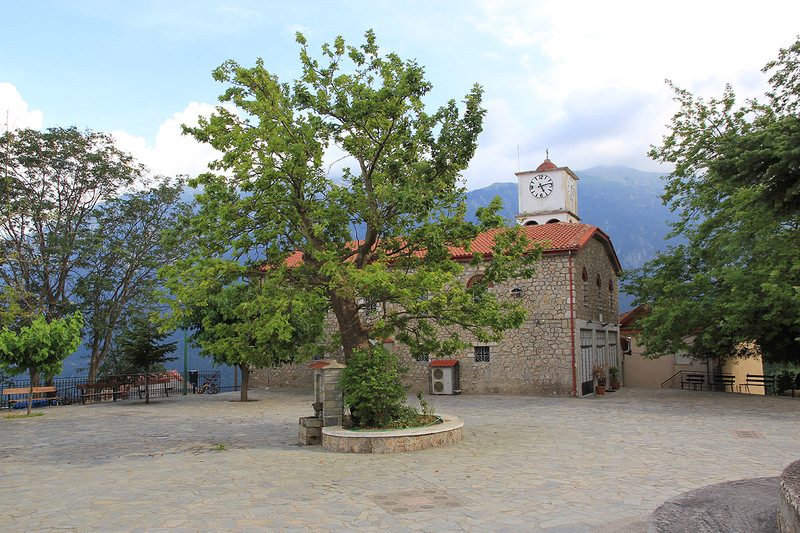 It turned out (after asking a bit around) that the old school, built in direct connection with the church, had been converted to provide accommodation for tourists. The phone number to a person in charge (2010) is +30-2265061251. We got up at 0500, the next morning and drove to the trailhead. Start of hike at 0530. We soon reached the higher, flat plateau and ran into a bunch (approximately 10?) of unfriendly shepards dogs. My walking poles seemed to work as an effective deterrent. We had read that the easiest route on this peak required "easy to moderate climbing". With no idea of what this really meant, we carried a short climbing rope and our harnesses. 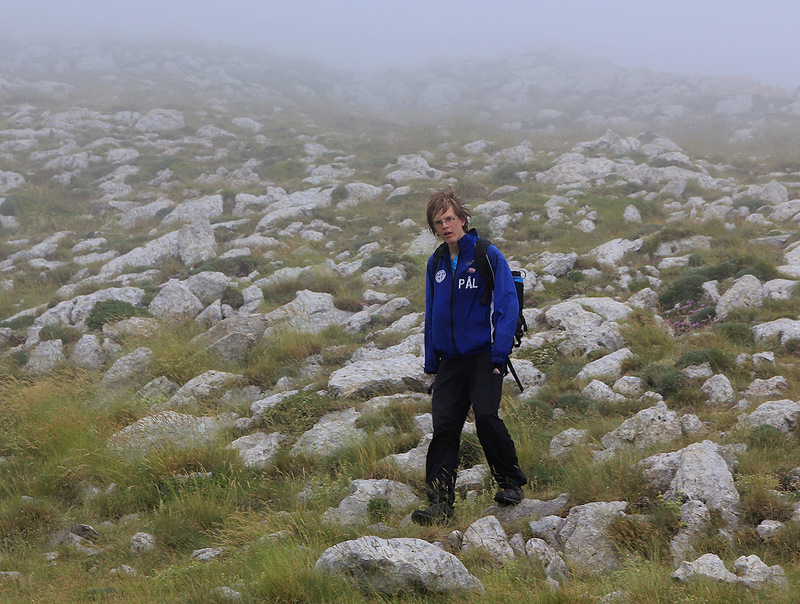 The summit was hidden in a cloud and we walked into the fog with severely reduced visibility. We expected to run into steeper terrain any moment, but the gentle slope kept going. Much to our surprise, the terrain got more flat and we strolled along the final summit ridge. We did not touch a single rock with our hands, - easy (YDS) class 2. Arrival at 0625, unfortunately, no view. We decided to postpone the breakfast for a place a bit further down. We left the summit at 0640 and returned to the car by 0905. On the way down, Pål Jørgen got one of my poles as we approached the sheep and their angry dogs. 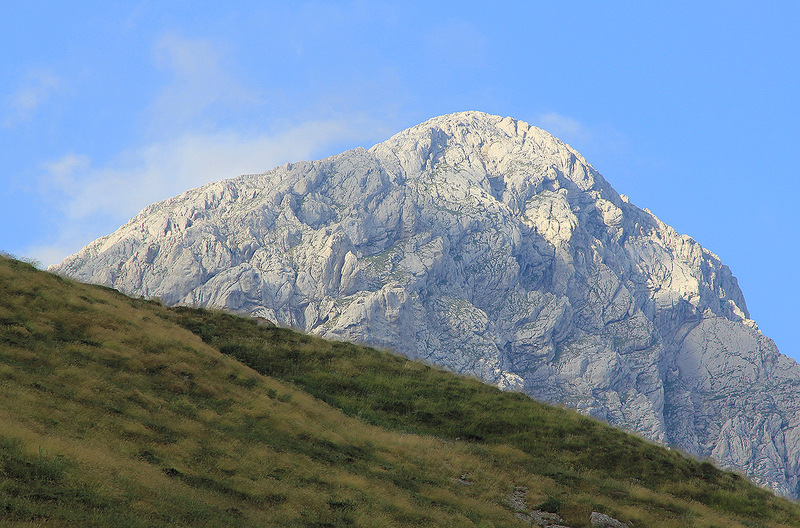 As we descended, the clouds started to break and it was possible to catch a view of the peak. 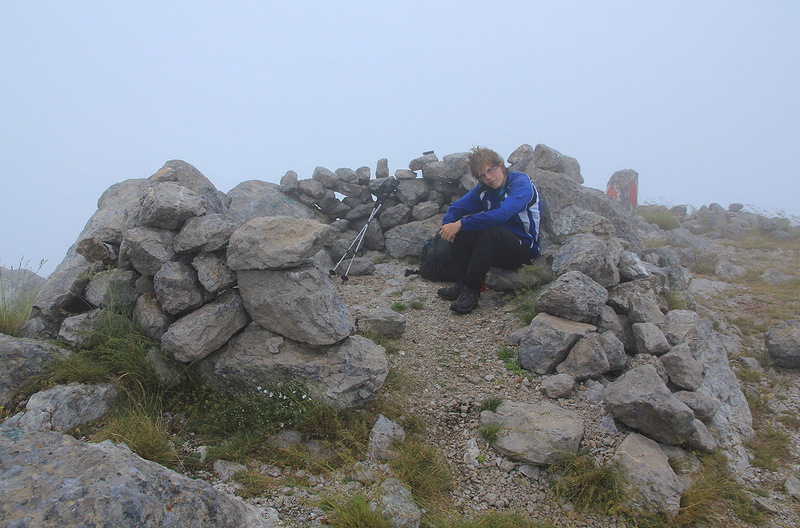 However, clouds kept coming and going, it would still be difficult to time an ascent and be assured of a view. 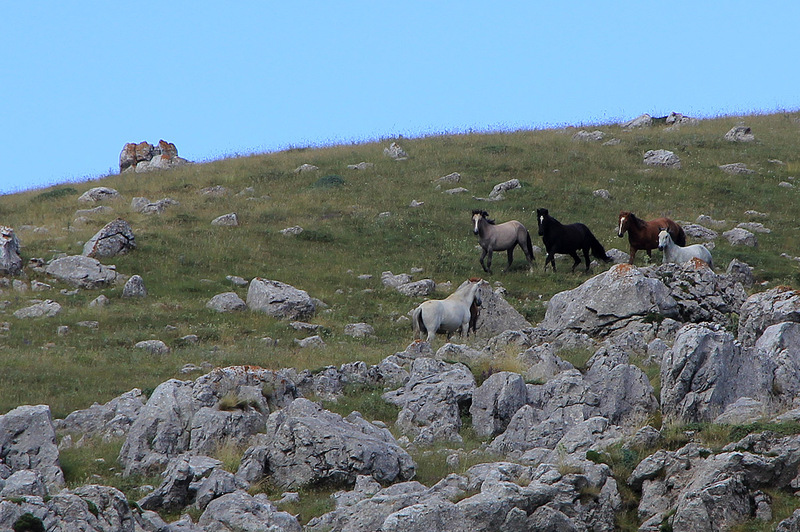 Further along, I observed a good sized group of horses. We were back in Kaloskopi by 0930. 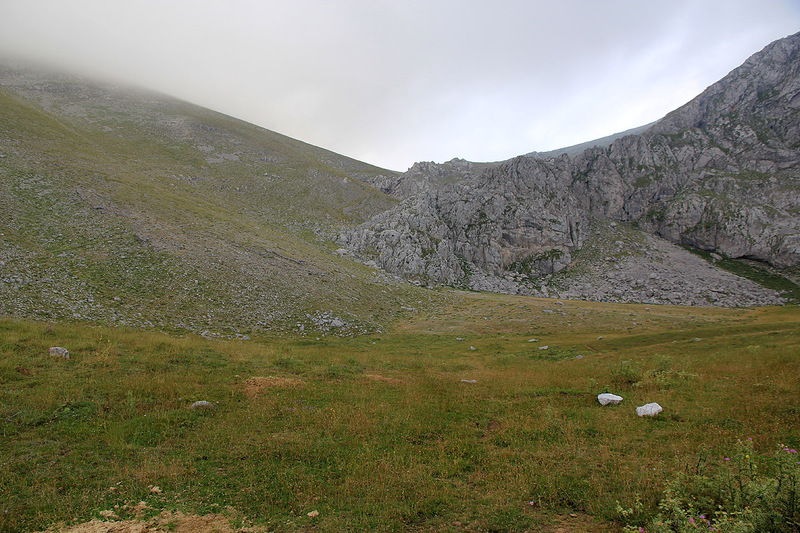 This climb completed my climbs of 18 ultra prominent mountains in Greece. Big thanks to Pål Jørgen for good company on many trips. Our summer trip would now proceed to the east coast where we would like to visit a "near ultra", before returning to Norway via Thessaloniki. 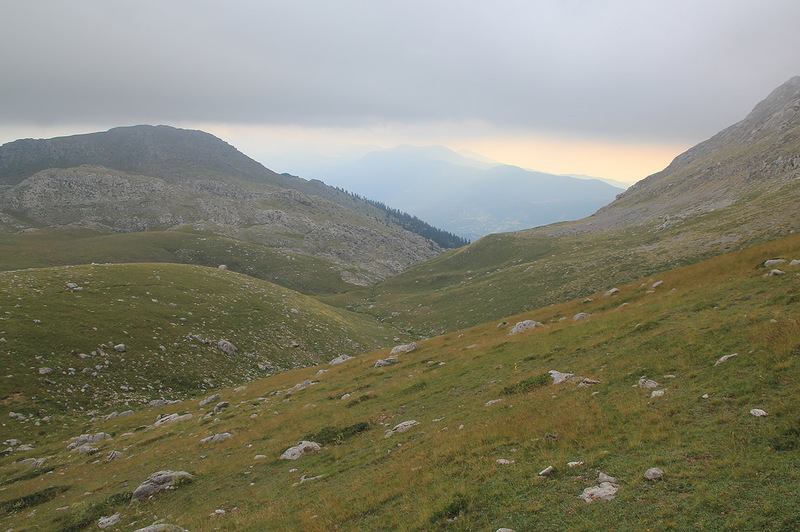 The descent from the main col, towards the sheep (upper part). Ascend further left, from the sheep towards the col (lower part). Descending from the upper plateau. Descending the upper part of the small valley.